Picot - Ch 3, sl st into top of stitch. -Stitches placed between these brackets [ ] indicate a group of stitches that are worked into the same space. Row 1: Ch 12, dc in 3rd ch from hook, dc in each across. Ch 1, turn. Row 2: Sl st in same st, [sl st, ch 2, dc] in next, dc in next 7. Ch 1, turn. Row 3: Sl st in same st, [sl st, ch 2, dc] in next, dc in next 5. Ch 1, turn. Row 4: Sl st in same st, [sl st, ch 2, dc] in next, dc in next 3. Ch 1, turn. Row 5: Sl st in same st, [sl st, ch 2, dc] in next, dc in next 1. Ch 1, turn. Row 6: Sc in same, picot, sc in next, sl st in next. Row 1: Ch 3, sc in 2nd ch from hook, sc in next. Ch 1, turn. Row 2: Sc in same, sc in next. Ch1, turn. Row 3: Sc in same, sc in next. Fasten off leaving long enough tail to attach to tree. Join near the bottom right corner of the tree with desired garland color. Sl st across to the other side, repeat two more times to get to the top of the tree. Magic circle, ch 1, 5 sc in circle, pull circle tight & join. Magic circle, ch 1, *hdc, sl st into circle. * Repeat *to* 4 more times. Fasten off with out joining, pull circle tight. Tie the two loose ends together and tie onto tree. 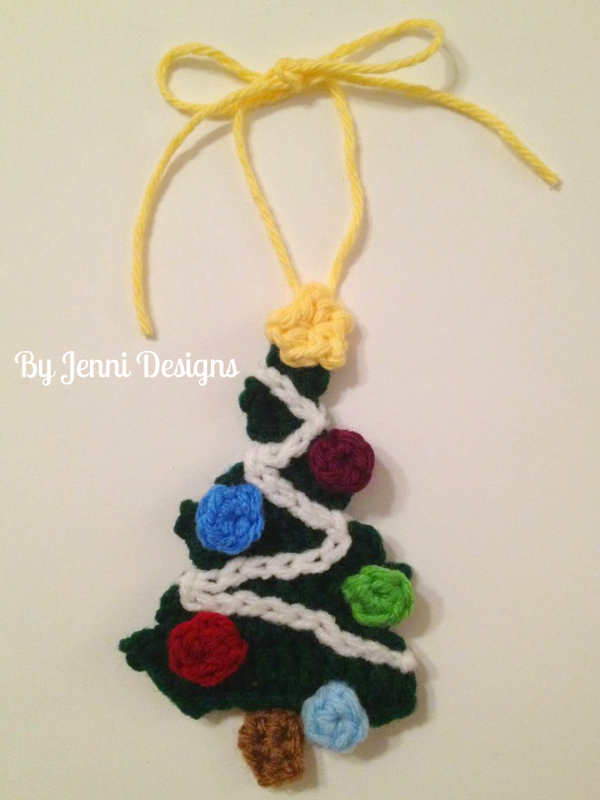 I also use the end to make an ornament hanger but you can attach a new piece of yarn when you are completely finished for hanging your tree as an ornament. 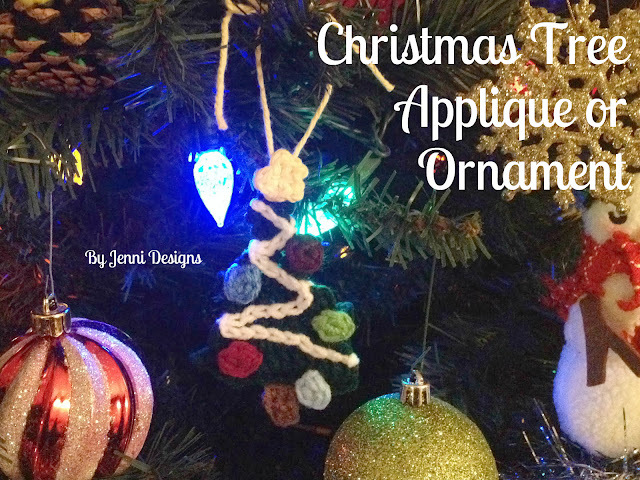 If you are using your tree as an ornament I suggest making a 2nd tree and sewing the two together after adding the ornaments and garland so that there is no need to sew in all those ends from the little ornaments.